Looking for an alternative way to control handle your Clients PC's Screen? then this post is for you. Note this is not hacking or a trick. I am just telling you as information that you need to know that will be of help as an Online solution solver. Yea, you can control or handle one PC's screen to put an end to that problem. 1. Clients can't finish your undone work? 2. Want to describe or tutor a clients how to a particular stuff? Then, if the above states describe your problems then, I recommend this to be the best alternates to make use of. Now, in this blog post, I will explain to you what you need to know and what to use to complete your undone job and get rid of that bugs. * TEAM-VIEWER: - According to Wikipedia, TeamViewer is a proprietary computer software child for remote control, desktop sharing, online gaming, web conferencing and file transfer between computers. * TeamViewer runs on the broadest spectrum of devices and operating systems ranging from state-of-the-art systems with the latest OS to older devices and legacy operating systems. Should this need configuration to work? 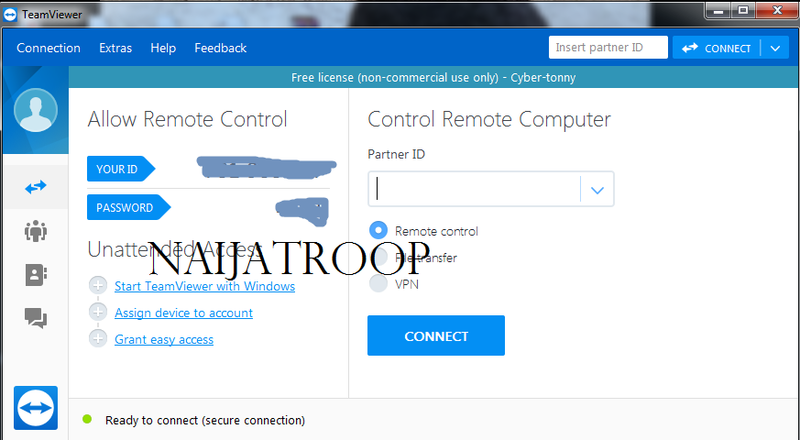 Start and use TeamViewer instantly. 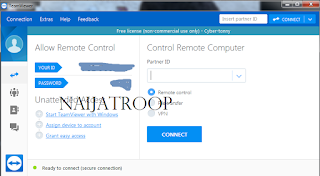 TeamViewer even works behind firewalls and automatically detects any proxy configuration. Easy to understand. 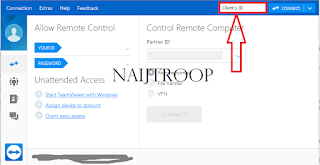 You can read more here: https://www.teamviewer.com/en/features/#gref Now, what to d and what to use, lets quickly dive into the how and how to operates it. 1.) 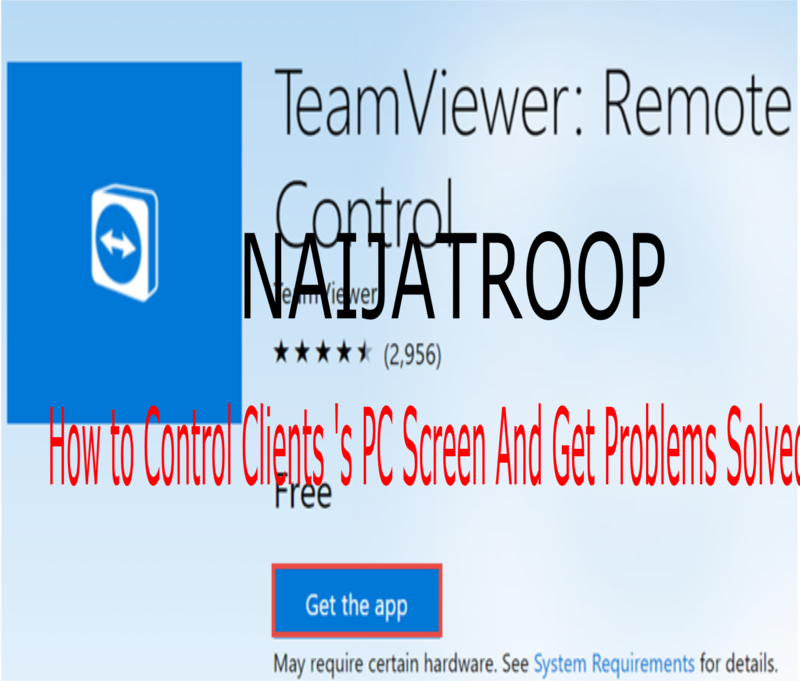 Download Team-viewer and install it on your computer or your desktop. Allow the process of installation to completes the installation, open and run it. 2.) Tell your client to also do exactly the process you had done. It's come with free trial and purchase method. You can go with the free trial since is not for long-term work just to complete you undone task. 3.) 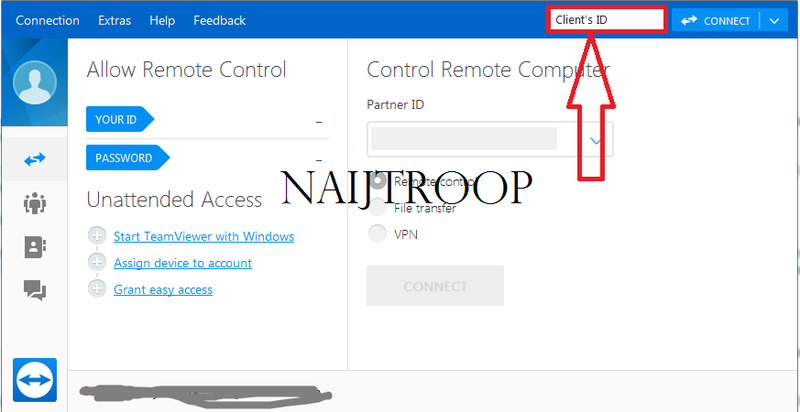 Tell your client to run it on his/her PC. While it's running, it will be displayed digits comprise of ID and PASSWORD. Ask for the ID and the PASSWORD for work. 4.) To control your client PC's screen you need the boat ID and the PASSWORD he/she shared with you. Now, navigate to the cursor to the "connect" section as the screenshot gives bellow paste the ID and hit the connect button. Waite for a while to fulling connect, to activate it fulling, you need the client's PASSWORD that he/she shared earlier. Paste the PASSWORD where its go to required you to past it. That's all, now you can fulling click the connect button. That's all, you are done. You can now have the full control of your clients PC or DESKTOP and get that bugs solved. This still supports charting, voice recording, video and lot of more! 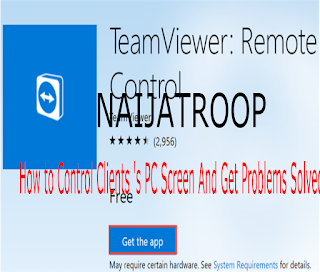 Cheer and get your client's problems solved by controlling his/her PC's screen enjoy. Special advice, only use this for legal and accepted activities, only! You must have a stable and fast internet connection for this to work effectively. After reading this blog post, what impact do you have to tell or you have any another alternate way to also share with the audience? A comment will be appreciated, in the comments box. And please don't spam else, your comments will be marked as spam! thank you for your understanding.